Lo-back toilet support featuring a contoured padded back and belts to aid and support individuals with disabilities when positioned over a toilet. 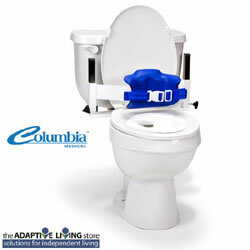 Inspired By Drive, formally Columbia Medical, Lo-back Toilet Support featuring an orthopedic-contoured padded back and belts to aid and support individuals with disabilities when positioned over a toilet. Inside Back Width at Top 7"
Inside Back Width at Bottom 7"
Inside Back Width at Top 11"
Inside Back Width at Bottom 11"
Inside Back Width at Top 13"
Inside Back Width at Bottom 13"